If you are interested in different tastes then we are inviting you to try indian food. With a magnificent view of the city from the 9th floor of Protected content offers traditional Indian delicacies and al fresco dining in the garden during the summer season. 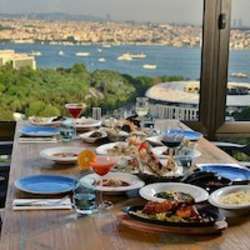 Located in the heart of Bosphorus, Protected content offers a casual atmosphere with delicious Indian cuisine. Vegetarians will appreciate the rich selection of non-meat dishes. If you are interested in, please join us. How you get there : You can check the map or there is an app which is Trafi. It shows all transportation from somewhere to somewhere. You can use it.